It's gonna be close to 90 degrees today. We went from the 50's to 80's in less the 4 days. It was so nice to be outside yesterday. 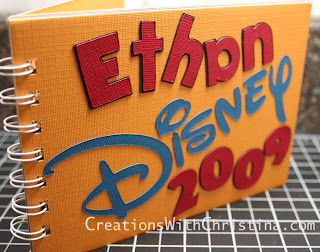 We are going to Disney in June and I wanted to start making my son and nieces autograph books. Here is the front cover of Ethan's. However this might change a 1000 times before we leave. I haven't started on the inside, but as I complete them I will post them on my blog. To make the cover I used Mickey Fonts (cricut), some DCWV Chipboard for the covers, and the bind-it-all machine. In celebration of hitting 15,000 views, leave a comment and I'll pick a winner to some fabulous blog candy. Drawing will be held on Monday evening April 27th. Christina - what an adorable autograph book. The kids will be the envy of all the other Disney guests. I'm sure people will be asking you where you bought them. Great job!! Can't wait to see the others. Enjoy your Disney visit!!! Dress comfortably. My hubby works there - so we go often. It's a magical place! Adorable autograph book. Enjoy your trip. I'm not a big disney fan, but love to see everything everyone else shares. I look forward everyday to your blog. Your book is great, Thank you for taking the time to share so many projects. I love the autograph book. I check your blog everyday, and love seeing the new videos. You do a great job. Hope you all have fun at Disney! It's a blast. What a cute autograph book!! I'm sure your son will have a blast getting it filled. I'm new to your blog, but I've checked it every day this week. Thank you for taking the time to post such fun stuff! It's definitely an inspiration to me. Love your videos - keep them coming! Have a great time in Disney - love the book! hi Christina! Thank you for sharing all your fun stuff! I checked your blog everyday and I just love your videos and project ideas. Thanks for the inspirations. keep up the good work! I'm sure your gonna have fun at Disney! Love your blog, love your book & love Disney - when we lived in FL we had season passes - was so nice to go spend a few hours & enjoy the parks. I enjoy coming to your blog everyday - whether it's a new video, card or project !! Keep up the good work. I love seeing all your creations and videos!!! Thanks for inspiring me!!! I love you blog and creative ideas. I visit your blog everyday. What an adorable autograph book. Thanks for give me a chance to win. I love your Web Site!. I wish you posted more. I check all the time.